September | 2008 | Let Teddy Win! It was in some ways a fitting end to a home season filled with one disappointment after another. The Washington Nationals were to play their last home game of the season last night, and as part of “Fan Appreciation Night” had planned a non-stop onslaught of giveaways every inning, but with the Florida Marlins facing elimination from wild card contention, no make-up game will be scheduled. The question on the minds of presidents race fans had been whether Abraham Lincoln would win a record 50th presidents race of the season, or Teddy Roosevelt would win his first, but neither will get his chance. Final standing here. 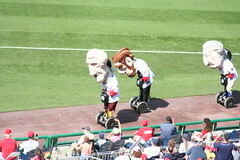 From YouTube member jjqb08 comes this video of Sunday’s presidents race in which fans were treated to the site of George Washington, Thomas Jefferson, Abraham Lincoln, and Teddy Roosevelt running the race aboard Segway personal transporters. As the video makes perfectly clear, the stunt was made possible courtesy of City Segway Tours. 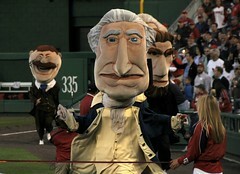 It was a lot of fun and a great promotional idea worthy of a permanent spot on our presidents race videos page. Looking forward to 2009, one can imagine lots of other possibilities for our racing presidents. What local companies would you like to see adding their own flair to a special race next year? The Washington Nationals returned to town last night for the last homestand of the 2008 season, hoping to erase the memories of a long road trip in which they went 2-7 and were swept by the Florida Marlins. They found just what the doctor ordered: the powerful New York Mets hanging onto a slim division lead in the final weeks of the season. New York fans don’t need to be reminded that they suffered a historic collapse at this time last year. With a seemingly insurmountable lead over the Philadelphia Phillies in late September, the Mets lost 5 of 6 games to the Nationals and missed the playoffs. With the pressure on once again, John Lannan one-hit the Mets last night to cut their division lead over the Phillies to just a half-game. 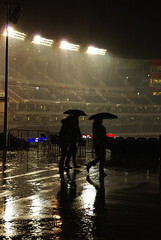 If you love a recurring story line, the next two nights at Nationals Park should be grand. Teddy Roosevelt is obviously a fan of recurring story lines as well. As this video by blog reader Rebecca Prowler shows, Teddy sprinted to a strong start last night in the fourth-inning presidents race. It was a clean race, but Teddy ran out of steam and Abe Lincoln took his record 45th win of the season. The fireworks should continue tonight at Nationals Park with free T-Shirt Tuesday, and tomorrow with the big St. Patricks Day celebration and exciting young pitcher Shairon Martis on the mound. Hope to see you there!